Last month, 200 tons of tangerines were airlifted from the South Korean island of Jeju to Pyongyang. That reciprocated similar gestures from Kim Jong Un after September’s inter-Korean summit, which culminated in an agreement outlining comprehensive measures for military de-escalation. To celebrate, Kim had sent 2 tons of pine mushrooms and two indigenous hunting dogs to the Blue House. The dogs gave birth to six puppies: a welcome metaphor for President Moon Jae-in and his North-South diplomacy. Observers are less optimistic than Moon. These gifts have been seen as gestures of goodwill at best and distractions from deception at worst. Critics say there is stagnated progress on the nuclear issue; summits have yielded no major breakthroughs. Regardless of warming relations, North Korea has not made meaningful steps toward denuclearization. These objections weaken on several fault lines. First, inter-Korean summits are distinct from other summits including North Korea. They have different agendas. Inter-Korean summits necessarily focus on de-escalation and confidence-building before larger issues. It is an outsider’s privilege to forgo immediate security considerations. Second, it is unrealistic to expect major breakthroughs within months of the first summit. Negotiations preceding previous nuclear agreements such as the 1994 Agreed Framework and 2005 Six-Party Talks agreement took years. Never mind that breakthroughs, or “turning points” in conflict studies terminology, are often preceded by crises yet to precipitate. Third, warming relations are inextricably tied to denuclearization. Disarmament means little if high tensions risk escalating comparably damaging conventional war. Finally, this produce swap does more than thaw relations. It is now one link in a chain of mutual concessions to reduce tensions and revive deadlocked relations. Over time, reciprocal rewards like these can induce the psychological shift necessary for nuclear negotiations and, ultimately, a Korean peace. This is more than tangerines and mushrooms. Reciprocated concessions have proven effective in reducing hostilities by both conflict management and behavioral psychological literature. In conflict management, they are part of Charles Osgood’s theory of graduated reciprocated initiatives for tension reduction (GRIT). First theorized in 1962, GRIT proposes a method for restoring negotiations whereby one side initiates an unconditional (“unilateral”) concession. The concession can be small or low stakes. By the norm of reciprocity, the other party should feel obligated to reciprocate. As reciprocated concessions increase in significance, parties progressively build the trust and incentives necessary for agreement. Certainly, the unilateral concession cannot endanger the first party nor indicate weakness. The initiator may also need to make multiple attempts before the other party understands and reciprocates. And if the opposing party defects after concession, the initiator must retaliate immediately and with clear purpose. With these conditions met, GRIT has successfully broken impasses throughout history. President John F. Kennedy’s 1963 announcement to unilaterally halt U.S. atmospheric nuclear testing was reciprocated by the Soviet Union, and quickly led to the Limited Test Ban Treaty. Sadat’s unprecedented peace trip to Israel is credited with catalyzing the peace process toward the Camp David Accords. The EU’s climate change leadership can be traced to its unilateral emissions reductions, setting global standards and encouraging reciprocity. GRIT is further grounded in reinforcement: the psychological theory that rewards and punishments can increase or decrease behavior. If Party A’s unilateral concession is seen as a reward, Party B can be triggered to respond positively. If seen as good behavior, Party B may itself decide to reward Party A with a reciprocal concession. The process inverts and repeat. Put simply, parties train each other into cooperation with GRIT. Re-conditioning the Seoul-Pyongyang relationship may take decades, but the sooner it starts the better. And it has. A pattern of reciprocated rewarding cooperation is already taking place. After years of aggression returned with sanctions, Kim’s sister Kim Yo Jong made the initiatory unconditional concession by visiting South Korea before the 2018 Winter Olympics – a first since the Korean War. North Korea followed with another unconditional concession by announcing the suspension of its missile testing. South Korea followed with meeting for the first high-level summits in 11 years. At the April summit, each leader crossed into the other’s territory in a low-stakes, symbolic, reciprocated gesture. 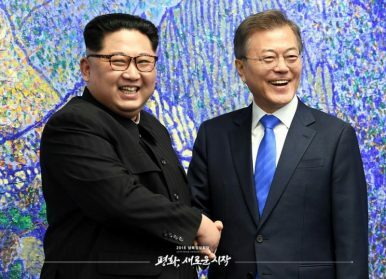 The resulting Panmunjom Declaration set off a whirlwind of joint endeavours: talks and agreement for family reunions; two more inter-Korean summits, most recently held in Pyongyang; troop and firearm withdrawals from guard posts; mine clearing in the Demilitarized Zone (DMZ); halting military exercises along the border; dismantlement of 11 guard posts each by December, followed by mutual verification; a pledge to cooperate against communicable diseases; a joint study for a trans-Korean railroad. And of course, trading tangerines for mushrooms and dogs. In GRIT and reinforcement terms, Moon’s Winter Olympics invitation to North Korea was rewarded with acceptance. Kim then reciprocated by inviting Moon to Pyongyang – also rewarded with acceptance. Both parties have reciprocated comparable military de-escalation measures. Joint initiatives unfold at the micro-level as reciprocated rewards for the other’s cooperation. The 11 dismantled guard posts are especially reminiscent of Soviet-era stepwise disarmament, GRIT’s most successful practice. Beneath the Koreas’ remarkable progress in 2018 lies a robust chain of mutually conditioning rewards, initiated by one party’s unexpected unilateral concession. U.S.-North Korean relations are slowly following suit. This year, instead of reciprocating sanctions and aggression, the United States has largely avoided breakdowns by satisfying or minimizing preconditions to rewards. The U.S. and South Korea have paused several joint exercises. The Trump administration has also agreed to talk before North Korea’s full denuclearization. American policy is trending toward unilateral concessions – a critical move in reviving Korean nuclear negotiations. Conceding to a rogue state can be concerning. But concessions are not inherently openings for exploitation. They are well-established methods of tension reduction. They are also one possible stimulus to train behavior. Further, concessions to “bad actors” do not necessarily reward bad behavior. Reinforcement depends on the behavior preceding it. This year, South Korea has offered its goodwill not to Pyongyang’s provocations, but to Kim’s outstretched hand – the right behavior. This does not mean the relationship is fast-tracked for détente. It is unclear whether concessions will graduate from low-stakes gestures to denuclearization. And environmental uncertainties like crises and administration changes can still break reciprocity. But North and South Korea are definitively on the right track to a powerful, subconscious relearning of peninsular relations. Tangerines reinforce gestures of goodwill; military dismantlement reinforces de-escalation; cooperation reinforces cooperation. Observers should seek to reward this trajectory. Rachel Xian is a policy research analyst at the Johns Hopkins School of Advanced International Studies. She specializes in East Asian conflict management, with research interests in conflict psychology and Chinese technology. US, South Korea Call Off Foal Eagle and Key Resolve Exercises, Announce New ExerciseKorea Commemorates 100th Anniversary of March 1st Independence ProtestsIs South Korea Ready to Say Goodbye to Its National Security Law?Can North and South Korea Narrow Their Gap Through Media Exchanges?Can Russia Play a Positive Role on the Korean Peninsula?